So we skipped a week this time, as I have been battling a minor cold for about 1.5 weeks. Atleast I’m healthy again! I managed to put in some work on the challenge, and my gold total is up quite a bit. I managed to pass 10 million in total sales this week as well! I have not played too much the last two weeks. I only really played any this week. I am working on leveling archeology on my alchemist to get Vial of the Sands. I am at just about 500 skill level now and I am exalted with the Lorewalkers, so ready to go farm mantid fragments very soon. My AH value is slightly down as I have spent very little gold over these two weeks. I am over 2 million gold in total across the two accounts now, so just about 1/5th of the way to gold cap in terms of liquid gold. We can see that I did not really log in the first week. Then I had one pretty massive mailbox after selling some huge BoEs! We can see that about half my sales this week comes from one Antorus BoE! The Leggings of the Sable stalkers sold for a lot of gold. 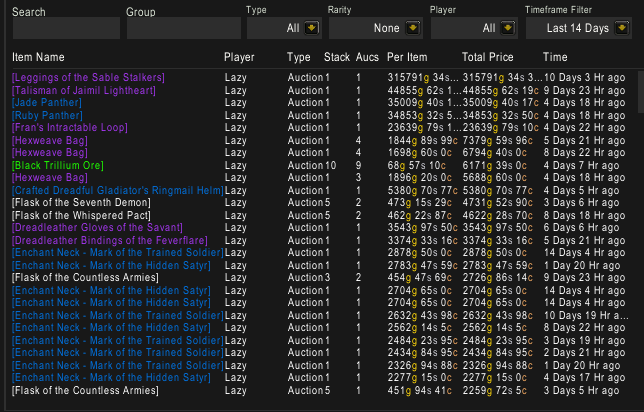 I also sold some panthers and some 101 BoEs, which is great. The hexweave bags I sold are the result of an attempt at flipping them. 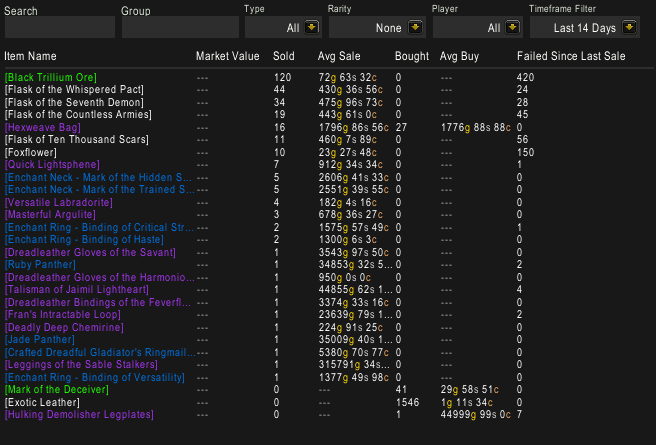 I bought them at 1715, so I made a decent profit overall, even if I sold some of them slightly below that. 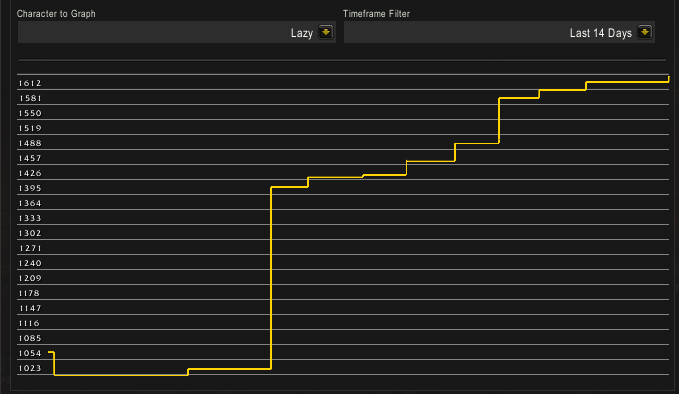 I should probably have changed my TSM settings to account for avgbuy, but I was a bit too lazy. I blame being sick. 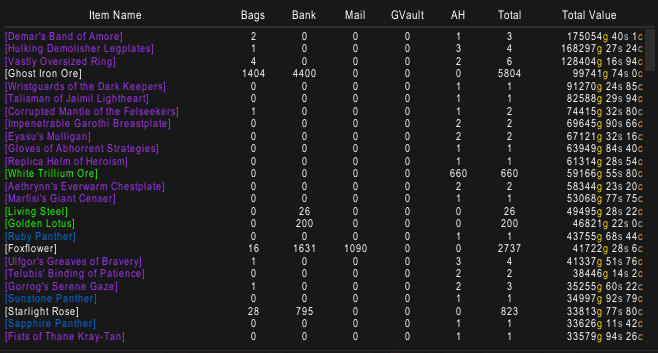 Alchemy sales have been great, and I am moving good amounts of flasks. I also sold a decent amount of trillium. Enchanting, jewelcrafting and leatherworking all continue to make an appearance as well! The only thing that bothers me is that the BoE market is going much slower, not sure if it’s mostly caused by me running out or if should change my pricing settings. I think I should probably remove avgbuy from my auctioning operation and just take the loss to ensure they sell. I still have a decent amount of BoEs here. It’s skewed towards 101s though and I want to get some more Antorus BoEs while they’re still good. My material stockpile is still good, I definetly need to keep the herbs moving as I do not want to get stuck with those when Legion ends as herbs are highly unlikely to retain value into BfA. i imported your “Old World Mining” group in tsm but ores (like iron ore for example) are not showing up in post scan. What is the reason behind this or what do i have to do to make it work? That group doesn’t have an auctioing operation for ores, so none of the ores will show up in post scans. You would have to add one or more auctioning operations to the ore subgroups to use it to post them. How do you come up on so many BoE’s from Antorus? I’ve had one total since the raid opened, and multiple clears every week since then, and only one drop. Do you just have incredible luck? I don’t farm them. I buy them cheap from the auction house to resell them at a higher price.